We've been pretty big fans of Nvidia's Ion product for netbooks, which turbocharges the lame integrated graphics found in Intel's Atom line with something really capable of decoding all that hi-def flash video on the web and even playing a few basic 3D games. If you'll recall, the previous generation of Intel Atom based netbooks were three-chip solutions: you had the Atom CPU, the "North Bridge" containing the memory controller and integrated graphics, and the "South Bridge" with all the I/O and interconnect stuff. The Ion platform replaced both the North Bridge and South Bridge with what Nvidia calls an MCP - media and communcations processor. It's basically a single chip that includes the memory controller, I/O, and integrated graphics. In other words, the original Ion brought the three-chip Atom solution from Intel down to a two-chip solution, while improving graphics performance. It was a major selling point. The Next Generation Ion, revealed today, sort of makes the hairs on the back of my neck stand up, not because it's a bad products, but because the marketing message isn't clear to consumers. It's no longer a "platform" - it's an add-on to an existing platform in the same way that any GeForce discrete graphics chip is an add-on to any notebook of any other size. It's just... GeForce for netbooks. For this and other reasons, the whole marketing message around the Next-Gen Ion is a little worrisome. Allow me to explain. The new Intel "Pine Trail" platform for netbooks (those netbooks with the Atom N450 or N470 CPU) gets rid of the North Bridge chip - the Intel graphics and memory controller have been integrated into the CPU itself. So with Pine Trail, Intel is down to a two-chip solution: the CPU and the South Bridge. What the next-gen Ion does is boost that back to a three-chip solution by adding a GPU, complete with up to 512MB of it's own DDR2 or DDR3 memory (something that wasn't required in the original Ion, mind you). This graphics chip connects to the South Bridge via a PCI Express x1 link. The new Ion will use the same Optimus technology Nvidia recently unveiled for larger notebooks. This is cool stuff. Basically, it's automatic switchable graphics that you, as a user, never need to even think about. Instead of the computer having an internal hardware switch to turn off the Intel integrated graphics and turn on the Nvidia discrete graphics, the computer simply always displays the Intel integrated graphics' frame buffer contents. The special Nvidia driver detects when you start viewing video or running 3D graphics and will power up the discrete graphics, copying the frames it renders to the Intel integrated graphics' frame buffer. Then, it automatically shuts off and powers down when you stop viewing video or running 3D. Optimus is really cool stuff, but the fact that the next-gen Ion uses it only further underscores that what once was a replacement "platform" for Atom-based netbooks is now an additional discrete graphics chip. The Next-Generation Ion will come in two flavors. One has 8 graphics cores, the other 16. They're really the same chip, based on a very low-end version of the GT2xx family, with some parts "fused off" on the 8-core version to achieve the lower power and thermal requirements of smaller netbooks. My guess is that it's the GT218 chip, found in the GeForce 210M. The 8-core version can have either a 32-bit or 64-bit memory interface, while the 16-core version always has the 64-bit memory interface. You'll find the 8-core chip almost exclusively in 10-inch or smaller netbooks, while the 12-inch ultra-premium netbooks and desktop "nettops" will get the 16-core version, since they have a little more wiggle room on thermals and power. Nvidia says performance of the 8-core version should be comparable to the original Ion, while the 16-core version should be as much as twice as fast. Here's another problem with the marketing: you don't know which one you're getting, really. One version of the chip is literally twice as fast as the other, but both are simply called "Next-Generation Ion." Nvidia tells us all the 12-inch netbooks and nettops are using the 16-core version, but there's nothing to force manufacturers to do this. If someone wants to make a super-thin 12-inch netbook and use the 8-core version, you really wouldn't know it unless the manufacturer spells out in the specs exactly which version of the "Next Generation Ion" it's using. This is like Nvidia selling two different GeForce mobile chips, one twice as powerful as the other, and not giving them different model numbers to differentiate each other. In fact, that's exactly what this is. Nvidia is focusing on the "experience" of Ion, which is genuinely much better than the stock integrated graphics you get with an Atom based netbook or nettop. The video decoding acceleration is worlds better, as is the 3D graphics performance. That was true of the previous generation, too. Nvidia has made some hay with the press about how the new Ion has a package size of 23mm by 23mm, which is 40% the size of the origional Ion's package, thanks in part to a shrink from 65nm manufacturing to 40nm. This is a completely disingenuous comparison. The first-gen Ion was an "MCP" product, a complete GPU plus memory controller plus I/O controller in one. It replaced two Intel chips with one from Nvidia. The new Ion replaces nothing, it adds a 23mm by 23mm chip and a bank of dedicated graphics memory to the new two-chip Intel Pine Trail platform. I'm all for giving users the ability to get away from the truly awful Intel integrated graphics and buy something better. The new Ion is definintely good news in that regard. 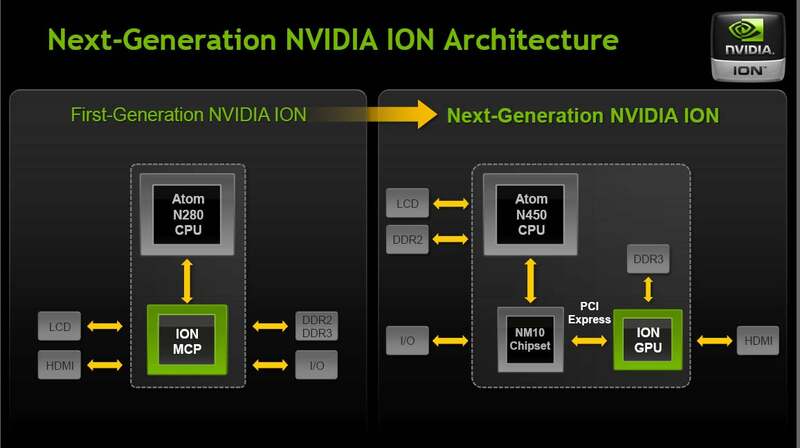 But let's call a spade a spade - the new Ion is just a really low-end GeForce mobile discrete graphics chip for Ions. To be fair, Nvidia doesn't claim the Next Generation Ion is a "platform" in its marketing materials, as far as I can tell. But by keeping the same branding as the previous product, which is a platform, it confuses consumers about what they're actually buying.